Don't miss this fabulous deal on the ghd Air! 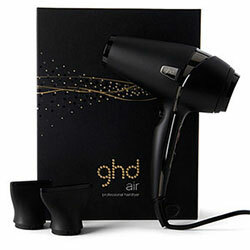 The official ghd site is currently offering a £20 discount on the ghd Air hairdryer, taking the total price to just £79. To receive the discount enter the code below at checkout. Click here to go to the deal. The official ghd site also offers free next day deliver on all stylers and dryers. The ghd Air features fast blow drying, variable heat and speed settings and advanced ionic technology to reduce frizz. Enjoy happy hair days with the ghd Air!